Campbell R. McConnell earned his Ph.D. from the University of Iowa after receiving degrees from Cornell College and the University of Illinois. He taught at the University of Nebraska-Lincoln from 1953 until his retirement in 1990. 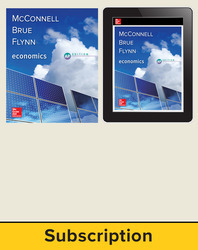 He is also coauthor of Contemporary Labor Economics, Seventh edition, and Essentials of Economics, First edition (both The McGraw-Hill Companies), and has edited readers for the principles and labor economics courses. He is a recipient of both the University of Nebraska Distinguished Teaching Award and the James A. Lake Academic Freedom Award, and is past-president of the Midwest Economics Association. Professor McConnell was awarded an honorary Doctor of Laws degree from Cornell College in 1973 and received its Distinguished Achievement Award in 1994. Stanley L. Brue did his undergraduate work at Augustana College (South Dakota) and received its Distinguished Achievement Award in 1991. He received his Ph.D. from the University of Nebraska–Lincoln. He is a professor at Pacific Lutheran University, where he has been honored as a recipient of the Burlington Northern Faculty Achievement Award. Professor Brue has also received the national Leavey Award for excellence in economic education. He has served as national president and chair of the Board of Trustees of Omicron Delta Epsilon International Economics Honorary. He is coauthor of Economic Scenes, Fifth edition (Prentice-Hall), Contemporary Labor Economics, Seventh edition, Essentials of Economics, First edition (both The McGraw-Hill Companies), and The Evolution of Economic Thought, Seventh edition (South-Western). Sean is an assistant professor of economics at Scripps College in Claremont, California. He is the author of the international best seller "Economics for Dummies" as well as the coauthor, along with Campbell McConnell and Stanley Brue, of the world's best-selling college economics textbook, "Economics: Principles, Problems, and Policies". An avid martial artist, Sean is a former Aikido national champion and has coached five of his students to U.S. national aikido titles. A recurring commentator on FOX Business, ABC News, and NPR, Sean holds a B.A. in economics from the University of Southern California and a Ph.D. in economics from U.C. Berkeley, where he completed his dissertation under the supervision of Nobel Laureate George Akerlof. Sean's research focuses on the often puzzling and seemingly irrational behavior of stock market investors, but he's also investigated topics as wide-ranging as the factors that affect customer tipping behavior at restaurants and why you see a lot of unionized workers only in certain industries.